WASHINGTON (CNS) — Quietly, a small group of U.S. Catholic bishops and Iranian ayatollahs began in March what they intend to be an ongoing dialogue on nuclear weapons and the role of faith leaders in influencing political moves on the issue of Iran’s nuclear program. 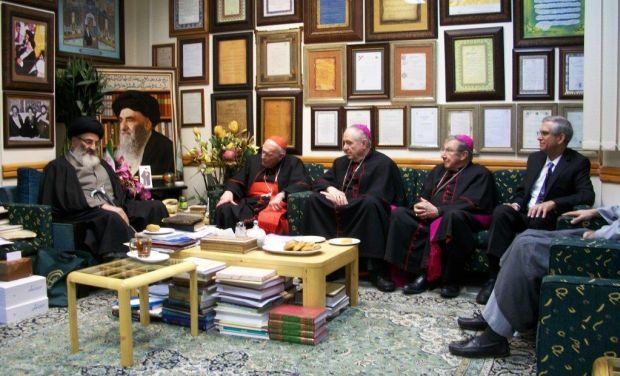 The meetings in Iran, hosted by the Supreme Council of Seminary Teachers of Qom, began with basic discussions of areas of philosophical and theological commonality between Catholicism and Islam, and concluded with a commitment to issue a joint statement, said the U.S. bishop who led the delegation. The four-day session between three U.S. bishops and four prominent Muslim scholars and ayatollahs began with contacts facilitated by two Iranian-American doctoral students of John Steinbruner, a professor of public policy at the University of Maryland and a consultant to the U.S. Conference of Catholic Bishops’ Committee on International Peace and Justice. He explained that Steinbruner had suggested such a dialogue to the committee. Once the bishops agreed, he and the students, along with USCCB staff, spent a year making arrangements. The State Department and the Vatican were advised of the project, but it remained an independent activity. Bishop Pates was accompanied by Cardinal Theodore E. McCarrick, retired archbishop of Washington, who has lengthy expertise in the Middle East, and Auxiliary Bishop Denis J. Madden of Baltimore, chairman of the USCCB Committee on Ecumenical and Interreligious Affairs. Stephen Colecchi, director of the USCCB’s Office of International Justice and Peace, told CNS that word of the bishops’ March 11-17 trip to Iran was not made public until May because it wasn’t until then that the participants had the chance to report on the dialogue to members of Congress and a deputy secretary of state. Colecchi and Steinbruner accompanied the bishops, as did Ebrahim Mohseni, one of the University of Maryland doctoral candidates. The Islamic clerics who participated were Ayatollah Morteza Moghtadaei, vice president of the Supreme Council of the Seminary Teachers of Qom; Grand Ayatollah Abdollah Javadi Amoli, Ayatollah Sayed Jawad Shahrestani and Ayatollah Ali-Reza Arafi. Word of the dialogue came out just as a round of talks were being held in Vienna about Iran’s nuclear program. The so-called P5+1, the five permanent members of the U.N. Security Council (the United States, China, France, Russia and the United Kingdom) plus Germany, began drafting a plan of action toward resolving fears about Iran developing nuclear weapons, according to the State Department. Bishop Pates said that in their sessions, the Iranian religious leaders and the bishops began from the common belief of Muslims and Catholics in the existence of one God who created humans and that therefore every person is to be revered. A second point of commonality came from the teaching of both faiths that because of their creation by God, each person has basic rights and human dignity. The Muslim and Catholic leaders agreed that the use of nuclear weapons is immoral because innocent lives would inevitably be lost, Bishop Pates said. From there, discussions considered the morality of a government obtaining weapons capabilities in order to defend its people from outside threats. Bishop Pates said they also touched on the morality of economic sanctions against Iran, which are intended to pressure the government to stop its pursuit of nuclear weapons capability. He said the delegation saw no particular evidence of poverty or other obvious effects of the sanctions, but that they heard stories of their impact. One of the ayatollahs, for example, told him he had had two sisters-in-law die of cancers that would normally have been readily treatable with medicines. Although medications are exempt from the sanctions, the religious leader told him, restrictions on finances mean that it is often quite difficult to pay for exempt items to be imported. But he said that among the group that went to Iran discussion arose about whether the Iranian people have responded to the sanctions with a renewed sense of national unity — much as Americans rallied together during World War II shortages of basic commodities — rather than with any feeling that they should hold their own government responsible for the hardships imposed by other countries. “Suffering for a patriotic purpose,” the bishop described the theory. The U.S. bishops also met with Christian religious leaders in Iran, Bishop Pates said. The Iran trip was followed in April by a “Colloquium on Revitalizing Catholic Engagement on Nuclear Disarmament” co-sponsored by Notre Dame’s Kroc Institute for International Peace Studies in collaboration with the USCCB; Georgetown University’s Berkley Center for Religion, Peace and World Affairs; and Boston College. Bishop Pates was a co-convener of the event that drew 40 bishops, policy specialists, scholars and students at a session at Stanford University in California hosted by former secretaries of state George Shultz and William Perry.